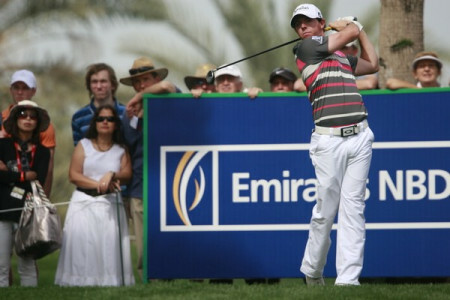 Rory McIlroy birdied seven of his last 10 holes to open with a 66 in Dubai. 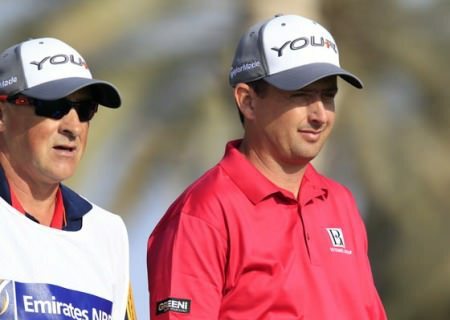 Photo Eoin Clarke/www.golffile.ieRory McIlroy missed a golden opportunity to earn some brownie points with his other half when he gave his caddie the credit for helping him birdie seven of the last 10 holes and open with a six under 66 in the Dubai Desert Classic. The world No 2 made a snail-like start to the final event of the Desert Swing, following six straight pars with a three-putt bogey from just four feet at the seventh. With Spain’s Rafael Cabrera Bello leading in the clubhouse on nine-under after a stunning 63, the 22-year old superstar could easily have hit the panic button. McIlroy was being modest about his birdie at the 18th. After a perfect drive, he hit a towering five-wood to about 10 feet beyond the hole and misread the downhill putt. Expecting a couple of inches of break from the left, his eagle effort trudled straight on. It was a rare miss over the last 10 holes for the reigning US Open champion, who credited his faithful bagman JP Fitzgerald for his green-reading skills on the way home. Caroline Wozniacki and caddie JP Fitzgerald at the Dubai World Championship last December. Picture Fran Caffrey www.golffile.ie Nary a mention of Ms Wozniacki. It was all about the putting and McIlroy rolled home more than his share in the 10 to 15 feet range on what he considered the easier holes. The back nine is a much more scorable nine. You have the three par-5s, there’s a couple of short par 4s. On the front nine you have that pretty tough stretch, 4, 5, 6, 7, that’s a pretty tough stretch. The course doesn’t really give you anything there. You’ve got the second and third hole which you might be thinking are birdie holes, but apart from that you’re looking at the back nine and you’re thinking, well, 10’s a reachable par 5. 11’s only a short to mid iron. 12’s a tough hole, but then you got 13, 14 are birdie holes, and 17 and 18. So there’s definitely more opportunities on the back nine to pick up a few shots. I think it started — it probably started on the ninth hole. I had two great shots into 9, and I made my first — I made a good putt for par on 5, but apart from that I hadn’t really held anything, so made a good putt on 9 for birdie, and that sort of started the ball rolling. Hit two great shots into 10, two-putted for birdie there. I holed a great putt on 11 for birdie. Getting up-and-down from about 65 yards on 12 for par was pretty big. You know, they’re really important to keep the momentum going, you know, of the round. And 13, I hit — actually felt like I hit a decent second shot. I thought it was going to hang on to the right side of the green, but fell in the bunker, and it was a pretty difficult bunker shot, but got that up-and-down. But yeah, once I made a couple of birdies, you feel a bit more comfortable, you get a bit of momentum and you get into a bit of a flow, and that’s what happened. Cabrera Bello started on the back nine and stormed to the turn in seven under 30 with pars at the 12th and 15th the only “blemishes” on his scorecard. He then birdied the first and second and confessed that he started to think about the magical 59 before finishing with seven pars. He still ended the day two shots clear of Marcel Siem - the German went out in 31 - and Scotland’s Scott Jamieson with McIlroy in a seven-way tie for fourth with the likes of Thomas Bjorn and world No 4 Martin Kaymer. After a rough spell rcently, the German appears to have taken his putting touch from the hotel room carpet to the course. Peter Lawrie shot a 67 that promised to be a lot lower. Starting on the 10th, he went to the turn in 32 with birdies at the 10th, 11th, 14th, 17th and 18th. But he came home in level par with a bogey at the first balanced by a birdie at the short seventh. Shane Lowry shot a four under 68 to share 15th place, telling his twitter followers it was his first sub 70 round using the yellow ball. Gareth Maybin had three birdies and an eagle in a one under 71. But that left him right on the cut mark as 76 players in the field broke par. Michael Hoey’s hopes of a top-two finish worth a trip to the WGC-Accenture Match Play took a battering when he carded a one over 73 while Damien McGrane’s poor start to the season continued with a three over 75. Damien McGrane fired a six under par 66 to trail a "sublime" Rory McIlroy by three shots after the opening round of the Omega Dubai Desert Classic.